The Fisker Karma, that beautiful plug-in hybrid sports sedan, finally got certified by the EPA. 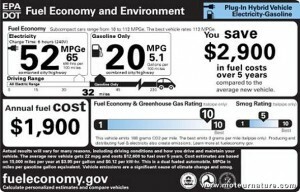 The car gets a 52 mpge rating in all electric mode, and a 20 mpg combined gas-electric fuel economy rating. The only other plug-in hybrid car on the market, the Chevrolet Volt, is rated at 94 and 37 mpg. So the Karma needs more energy, but it’s a bigger car, and also a much faster one, so we shouldn’t be surprised about the all-electric energy consumption. The 20 mpg rating in hybrid mode is more disappointing. The Buick Regal GS with the 2.0-liter turbo Ecotec engine, a very close cousin of the Karma’s gas engine, gets better than this without any hybrid technology. Even more disappointing, the EPA found out that the car’s range on battery power was only 32 miles. From a 22-kWh battery pack, we were expecting at least 50 miles, as Fisker said it should do. We bet the Karma looks so great, it could sell on looks alone, but greenies were expecting better numbers from such promising technology.